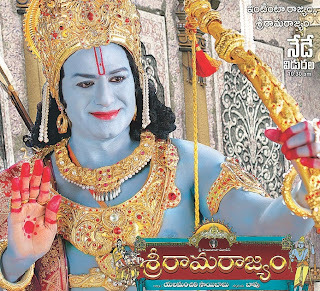 Sri Rama Rajyam(2011) movie is based on Uttara Ramayanam, i.e., Lava Kusa. In which, Bala Krishna is going play lord Rama in a film and Nayantara will portray the role of Sitadevi.The dialogues are being written by Mullapudi Venkata Ramana, Kamal Kannan, who won national award for his remarkable work in ‘Magadheera’ and the music is being scored by Ilayaraja. Sri Rama Rajyam is set in the Uttara Kandam of the Ramayana that deals with the story of Lava and Kusha. After Rama (Balakrishna) and Sita (Nayanatara) get back from Lanka, the Kingdom of Ayodhya rejoices and everyone is happy for a while. But Lord Rama is forced to banish Sita from the Kingdom when a washerman (Brahmanandam) questions her ‘pavitratha’. Sita takes shelter in the Ashram of Maha Rishi Valmiki (Nageswara Rao) and raises her kids Lava and Kusha as normal kids without informing them of their heritage . Lava and Kusha are trained in all the ‘vidyas’ by Valmiki. A series of incidents later, Lord Rama performs the Ashwamedha Yagam for the benefit of the kingdom. The sacred yagam horse wanders through the forest and it is captured by Lava Kusha. A confrontation erupts between the kids and Lakshmana (Srikanth) and when Lakshmana falls, Lord Rama enters the arena. The fight is prevented by Sita and she reveals her true identity to her kids. Lava and Kusha are re-united with their father, Lord Rama, and Sita unites with her mother Bhoodevi (Roja) and leaves this mortal world.